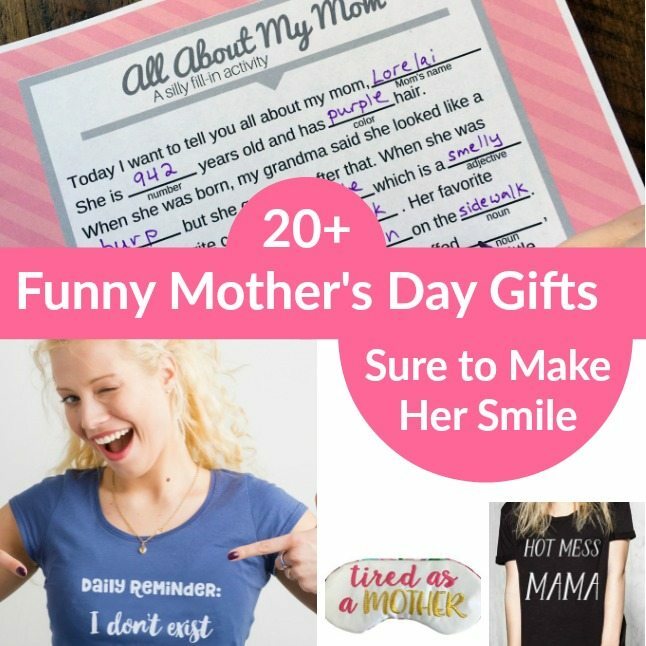 Inside: Make mom smile this year with these Funny Mother's Day Gifts, ranging from cute and punny to downright hilarious! Growing up, some of my strongest memories are of when I made my mom laugh. Okay, when I made anyone laugh, but especially my mom. We had so many running jokes, we had turned them into this goodnight routine, where we recited them all in a row as fast as we could. Now that I'm an adult I still love finding ways to bring laughter into my mom's life. And as a mother myself, I cherish the times my kids have made me laugh as well. I wanted to share some of the ideas I've used and found over the years to make mom smile on Mother's Day. Some of the ideas below are DIY Mother's Day gift ideas, while others are Funny Mother's Day Gifts to Buy. Click through each one to get the tutorial or purchase them. 1. Mother’s Day mad libs – Print one for each kid to do, so funny! 3. Mom's Sleeping Door Hanger – LOL! My kids would totally make this for me, they always say my favorite hobby is napping! 4. Proud Mom of a Living Legend Shirt– This would be an awesome gift from any kiddo! 5. Funny Printable Mother's Day Poem Cards – These are co cute! 6. Hot Mess Mama T-shirt – Okay you have to have a sense of humor for this one! Perfect for your best mom-friend. 7. If your kids like to perform, they can sing this hilarious Mom Song to the tune of William Tell Overture. 8. Print out some funny Mom Wine Labels and order some wine. Boom. Gift sorted! 9. Tired as a Mother Sleep Mask – Heeeck yessss! 10. Perfect sibling rivalry gift: “My Favorite Child Gave Me This Awesome Shirt” t-shirt. 11. 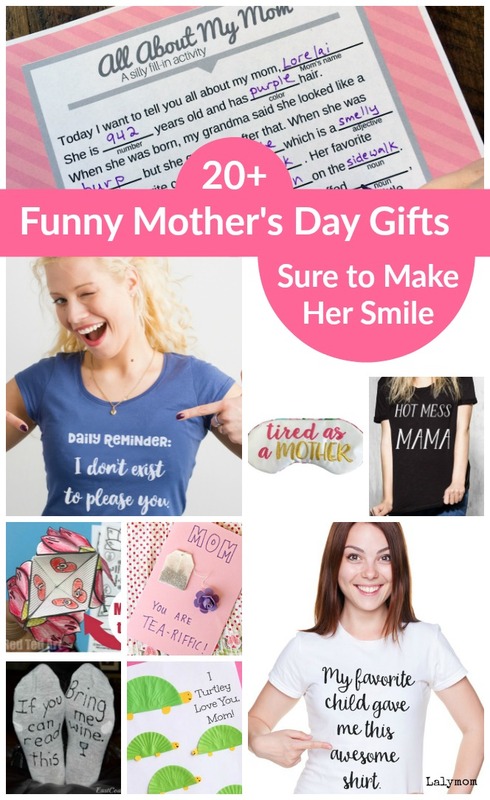 Give your mom a Time Out (spa day) or tell her Mom's Grounded (gets the house to herself) with one of these 5 funny Mother's Day Gift Ideas based on mom's most frequent disciplinary quotes. 12. Whether your mom is always there when you need her, or a breast cancer survivor like mine, every mom deserves a Superhero Mother's Day Gift. 13. If a card is not enough, how about a Super Mom Cape?! 14. I love a good pun, and this DIY Mom You're Tea-riffic Card fits the bill. 16. If mom ever folded up a “cootie catcher” or “fortune teller” she will surely laugh out loud when she sees this Mother's Day Fortune Teller. Fill it with funny things about mom and it will be a treasured memory for sure. 17. World's Okayest Mom T-Shirt – We all have days where this totally applies! 18. G0t crafty kids? Try this Turtley Awesome DIY Mother's Day Card. 19. Manic Mom Day T-Shirt – Yes. She loves that song. 20. If You Can Read This… Socks – You can actually make your own super awesome DIY If You Can Read This Socks or buy premade versions on amazon. 21. Kids got a lot of energy? Give mom this Musical Massage T-Shirt. Let the kids “play” the drums and piano to treat mom to a sweet back massage! 22. For any LEGO Loving family, you have to try this LEGO Mom Photo Frame. What kind of Funny Mother's Day Gifts are you giving this year? Ooh these are all fabulous! Adore them. Thank you for including our ideas and have pinned (well scheduled.. teehee, my live pinning isn’t working.. argh)!